Hannah was soaking the tea towels in stain remover. 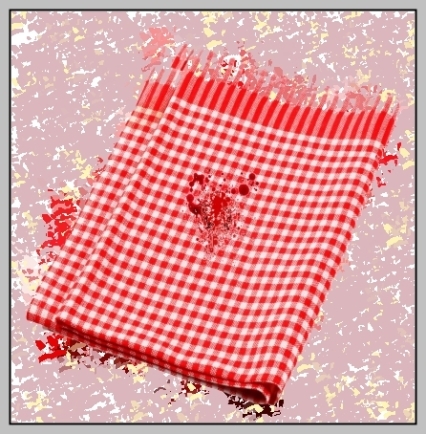 There had been great blotches of blood on a couple of tea towels. She had no idea how the blood got there. She’d earlier been cutting up a chicken carcass with the very sharp kitchen carving knife, but she certainly wouldn’t have wiped the blood onto the tea towels. And then she saw it! My God! Behind the laundry door! The body of her estranged husband. Apparently stabbed to death. Blood on his clothes. Her estranged husband didn’t even live in the same house. He hadn’t visited. She ran, almost hysterically, to the neighbours. They phoned the police. Forensic scientists said her husband was murdered with the kitchen carving knife. It was his blood on the soaking tea towels. Hannah was terrified. She’d been home all morning. She hadn’t done it. She hadn’t heard a thing. There had been a murderer in her house. Hannah was arrested. She was tried. She was found guilty. She’s in prison now. Still claiming innocence. Oh yes! She’d cooked and eaten the chicken, and thrown away the bones. All before breakfast.